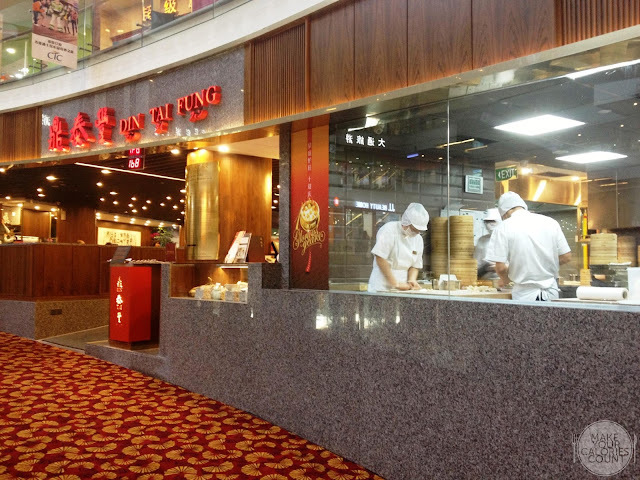 It was almost a decade ago that the first Din Tai Fung landed in Singapore under the Breadtalk Group and since then, I had been a regular patron be it in Singapore or overseas. We recently visited one of their branches located at Tsim Sha Tsui in Hong Kong (review may be referred to here) and it was an equally pleasant experience! 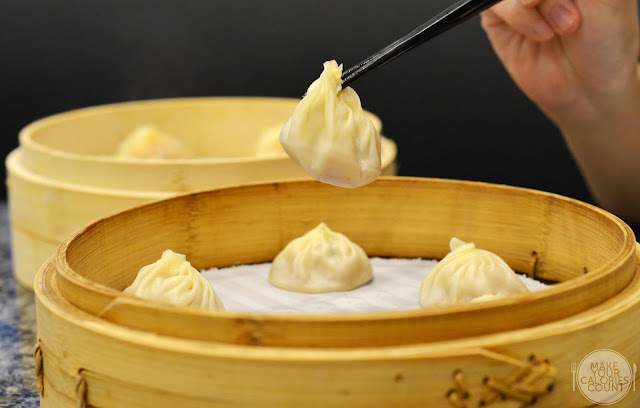 At Din Tai Fung, one can expect to dine amid a modern setting designed with the purpose of offering an enjoyable dining experience for all customers. Decked out in earthy tones and illuminated by ambient lights, a cosy space has been created suitable for idyllic dining. The elegant interior is also the perfect understated backdrop for the ubiquitous show kitchen, which takes centre stage. Comfortable designer furnishings such as cushioned booth seating and plush chairs further augment the overall environment. 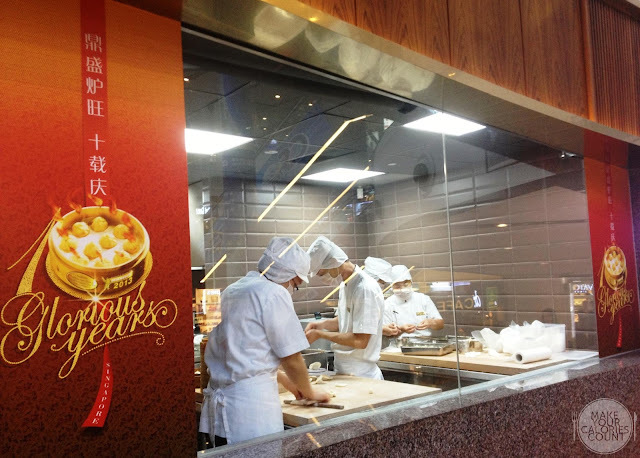 It is also one of the few Chinese-cuisine serving restaurants around where customers can witness the world-class showmanship of chefs working in the open concept kitchen where edible masterpieces are created and executed with precision and skill. At any point in time, the kitchen sees a flurry of action and activity yet the exquisite creations were produced with a sense of controlled calmness and concentration. Customers may be shutter-busy on their smartphones or digital cameras outside the open kitchen separated by glass panels but they will not manage to distract the dedicated chefs. 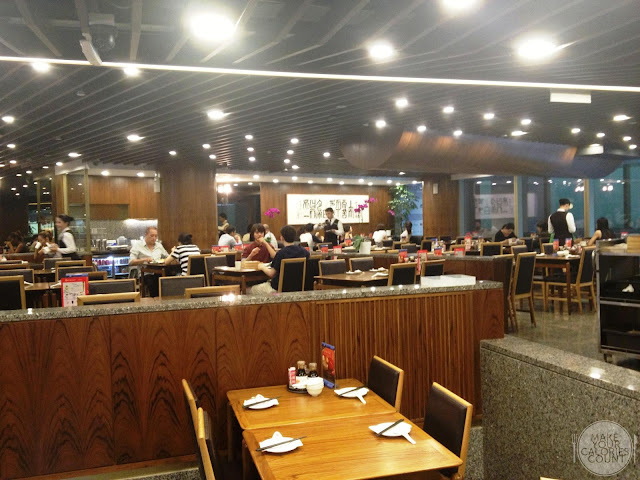 Visiting Chinatown Point for the first time since its re-opening, we saw the familiar restaurant faces and we decided to try Din Tai Fung some light yet delectable dishes since it was a late lunch and we had a dinner appointment later in the evening. The restaurant was sparingly filled with diners as it was the off peak period and while there were just two of us, we were ushered to a table at a cosy corner with comfortable sofa seats. 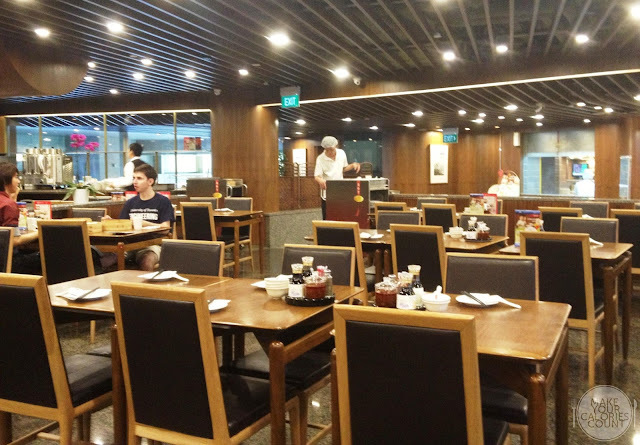 With a hungry appetite, we waited no longer before submitting our orders self-recorded separately on an order chit and passed to the patiently waiting server. Attracted by the special offering of the steamed chilli crab dumpling, we thought it was a must-try! The above order chit would be passed to you together with the menu. The appetizer was a good awakening to any diner's senses and being a recommended dish on the menu, it lived up to expectations. For a very simple dish, it was very well marinated and balanced in terms of flavour and texture. 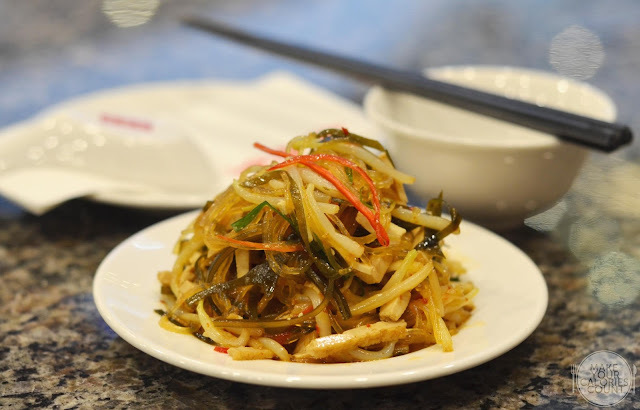 You get the crunch from the fresh bean sprouts with heads and ends thoughtfully removed, seaweed and the softness from the finely sliced beancurd. It looked innocently simple but the flavours were bold and intriguing, derived from the sliced chillis and their special vinegar dressing which appealed to me. I have a natural tendency to avoid vinegar dishes for they somehow do not get along well with me in terms of tastes. I however enjoyed this dressing due to its balance with a hint of sweetness after taste so the acidity of the vinegar was well neutralized. One cannot claim to have visited Din Tai Fung without trying their signature steamed pork dumplings. It seemed like a staple feature on the order list and there was no reason not to be the case. With each dumpling hand-wrapped in a delicate dough skin, it was then pleated with a minimum of 18 exquisite folds, twisted at the top and steamed. I found that the quality control across all the outlets in Singapore were very well managed. The wrapped skin containing the succulent minced pork was soft and thin yet strong enough to hold that luke-warm broth within. The best part was that the minced pork did not have that appalling stench or porkiness that some might refer to, so our senses and taste buds were pleasantly titillated. As the restaurant was quiet during the time of visit, we waited some 15-20 minutes or so for the dumplings to be ready. It showed every sign of freshness in preparing and cooking these delectable treats that one could just pop it in a mouthful and enjoy the savouriness of it all with the broth bursting out of that delicate skin! 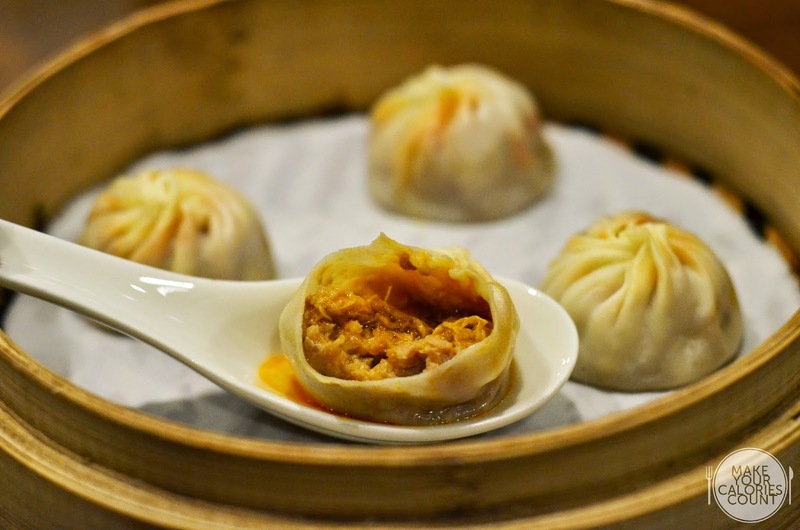 The signature steamed pork dumplings came in 2 offering sizes, with the 6 pieces at S$6.80++ and 10 pieces at S$9.50++. We were actually attracted by this offering with stand-up posters at the front of the restaurant. 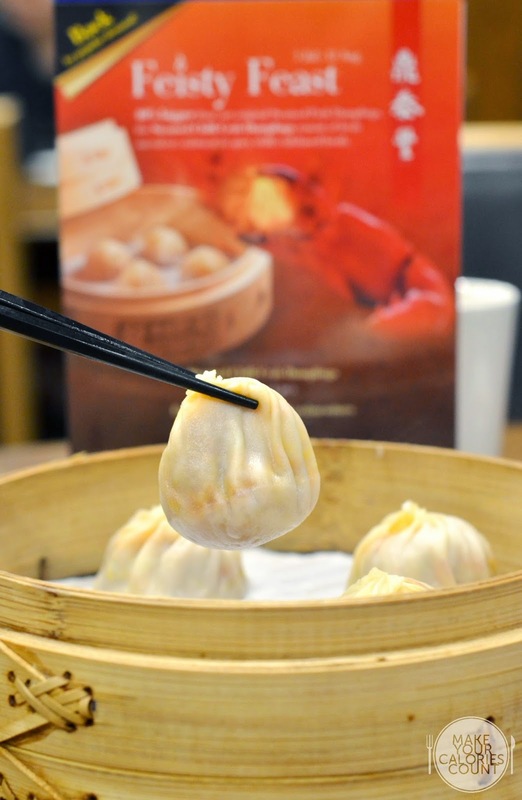 For a limited time only from 1 July - 31 August 2013, Din Tai Fung is bringing back the popular steamed chilli crab dumpling. We thought it was a brilliant concoction of fresh succulent crab meat blended with the minced pork, soaked in a mildly spicy chilli crab-based broth. It was 40% bigger than the usual offering of steamed dumplings but I still managed to pop it in and savoured it whole in a mouthful. The initial taste was in fact the savouriness experienced in the pork dumpling but quickly you could be hit by a wave of mild spiciness, summed up with a rather strong punch tasting of tomato ketchup. I do not quite think there is anywhere else in this world but Singapore who can claim the rightful owners to preparing chilli crabs with tomato ketchup so when that last element kicked in, you know for a fact it is uniquely Singaporean. 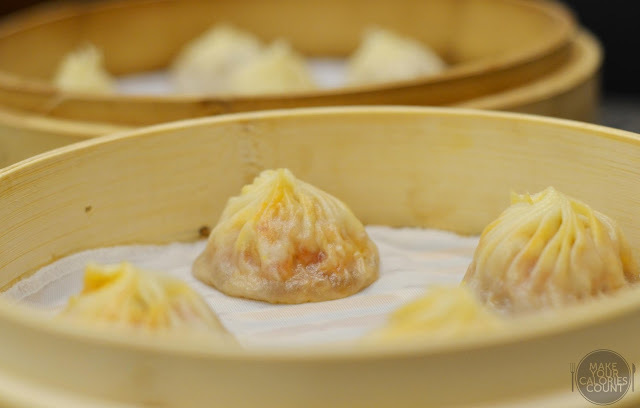 While strands of the fresh crab meat could be tasted, do not expect to be overwhelmed by the seafood for minced pork significantly contributed to the savouriness and taste of the dumpling. The crab-based broth was surprisingly light yet managed to pull off a good hint of that chilli crab, leaving one to reminisce the after taste. However, do not expect it to be spicy nor a bold rendition for while this was influenced by Singapore's unique cuisine, it maintained the culinary style of Din Tai Fung in offering light flavours. Offering in just one size of 4 dumplings, be prepared to order 2 portions! A special promotion is also under way for Citibank Cardmembers with a 15% discount for this dish, which would be administered during payment. This had been a regular feature in our orders for the past years. 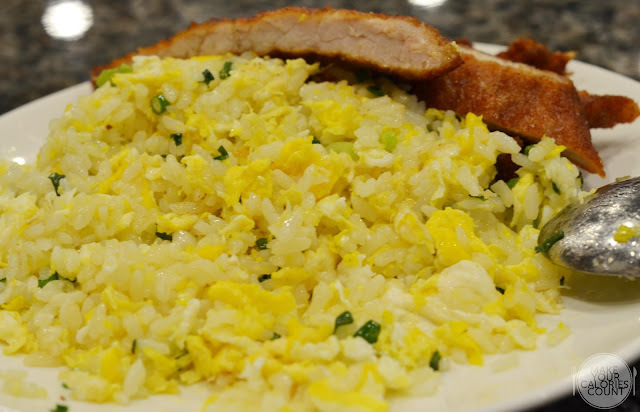 We always thought that the hardest dish to master is always the simplest dish and for Chinese cuisine, I would undoubtedly list fried rice as one of the hardest dish to cook. The wok fire (wok-hei) was spot on where the flavours of the ingredients were well-imparted by the strong fire in the frying process. There was always an abundance of fresh beautiful egg in the fried rice that we could not help but salivate. 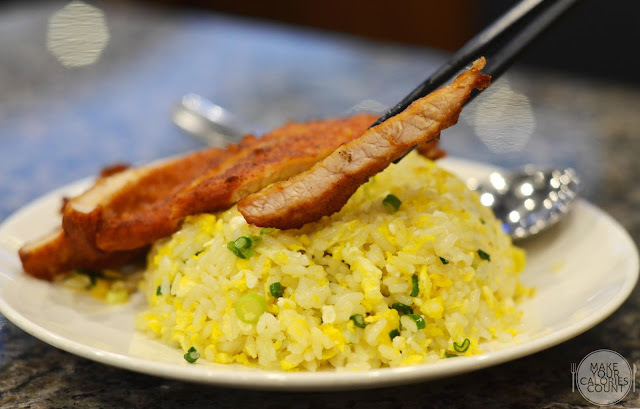 Compared with past dining experiences at Din Tai Fung with the most recent in Hong Kong, we felt that this dish had some elements that could be improved upon. The rice grains were too moist and soft so expect some clumps in that pool of carbohydrates. The ideal fried rice should have the grains individually separated as the oil is skilfully and evenly distributed without tasting overly greasy for the diners. We actually enjoyed the beautifully fried pork chop that had a glistening touch to that golden brown colour better than the one tried in Hong Kong with the latter tasting a touch too strong in the black pepper seasoning. This rendition suited our palate more as it carried a lighter hint of that important spice, beautifully infused into the protein. The pork chop seemed to be slightly overcooked which resulted in the protein tasting a tad too stiff but it was still within acceptable standards. 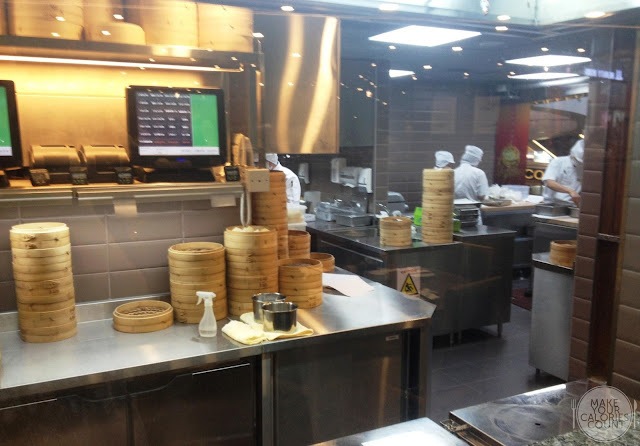 While it remained a good dish, we felt that we had tried improved versions at other Din Tai Fung branches. The service of the waiting staffs was immaculate and they were courteous in every way possible. While we stayed slightly longer after finishing our meal, they insisted that there was no need for rush and merely wanted to clear our plates for our comfort. 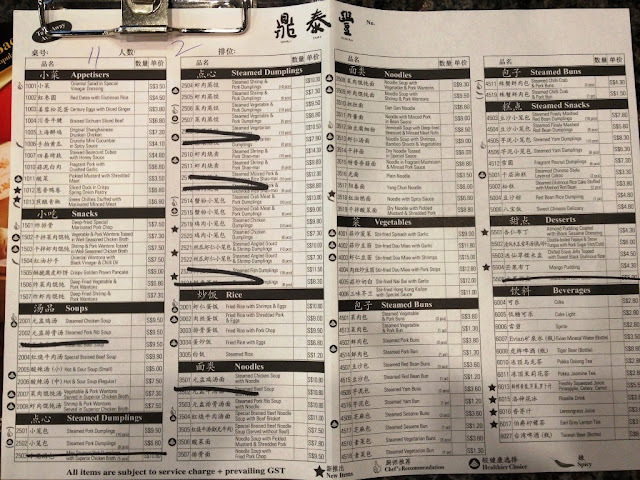 As usual and expected at each and every Din Tai Fung outlet worldwide, every passing server along your way out of the restaurant would thank you with a genuine smile with heads slightly bowed. 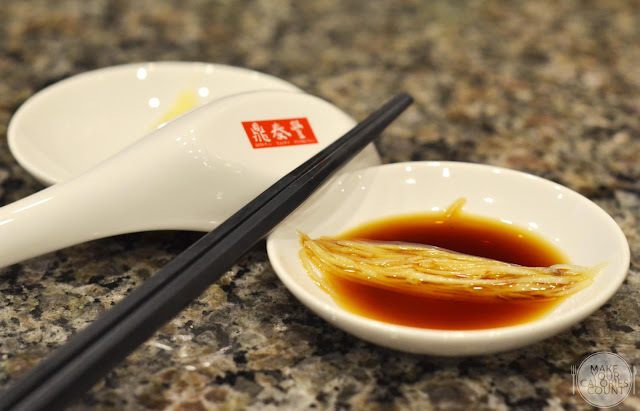 We had Jasmine Tea which was served to us upon our seating and unlike most restaurants that serve bland and seemingly inferior quality tea leaves, the ones served at Din Tai Fung were bold in flavours and carried with it a beautiful fragrance. The tea leaves were also thoughtfully filtered before being served to customers and priced at S$1, we had numerous refills without any surcharge. A standard 10% service charge and 7% GST was administered accordingly on the bill but it is one of the few restaurants around that I would have no qualms paying extra for their service. 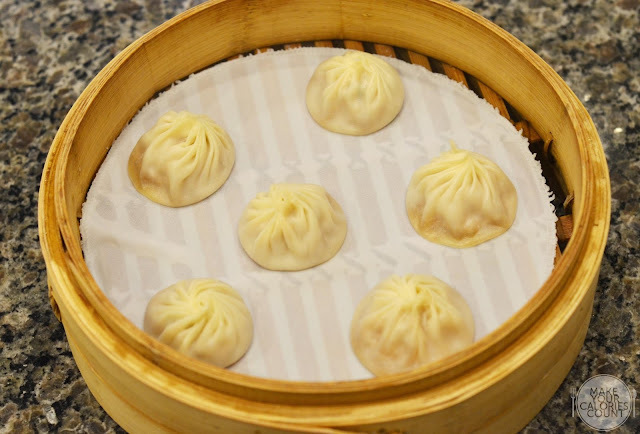 Din Tai Fung remains a restaurant that we will mark as a MUST-TRY place and is certainly deserving of its Michelin 1-star status with a menu marked by quality offerings, good customer service and affordable pricing.